As Technical Services Account Managers for Dynamics CRM on the Deluxe Support team, my colleagues and I work with many of the largest CRM deployments out there today. I’m going to document some of the performance related settings that can be made to CRM to help improve performance when you are in a 100+ user deployment. This indicates that you will be synching all appointments, tasks and contacts (by default just those you own) to CRM every time you launch Outlook and every 15 minutes when Outlook is running. You will also synchronize any CRM customization changes according to this schedule. 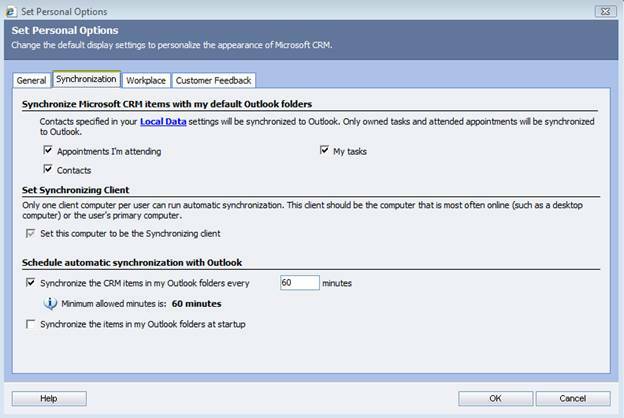 This synchronization process slows down the launch of Outlook and users may complain that Outlook takes longer to load now that CRM is installed. If the CRM users are not creating many appointments, contacts and tasks within the Web interface or the web navigation within Outlook, it is generally not necessary to synchronize CRM and Outlook this frequently. In a call center environment, I could see how it would make sense to keep the default synchronization settings, but in most environments where you’re creating 1-5 new appointments, tasks or contacts, it’s probably overkill. 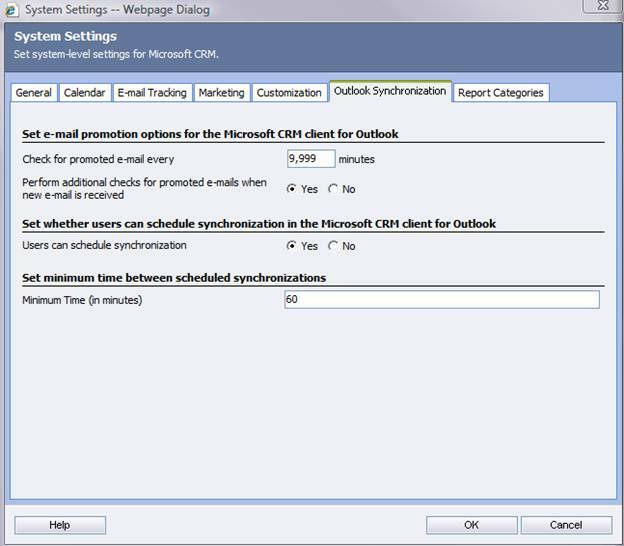 Also, if you need to synchronize at a certain point, you can always do it manually by choosing CRM > Synchronize Outlook with CRM (and as a bonus, you get a progress bar!). Once you’ve settled on the best approach for your organization, change the System Setting to the appropriate time for your organization. Then, if you are manually installing clients, I recommend you add a step to the install process to open Outlook, Go Offline (if it’s a Laptop client) and be sure to uncheck the Synchronize on startup option. It’s important that you synchronize at least once, so you can pull down the CRM customizations. If you are doing a remote install, you could flip the registry key “RunOutlookSyncOnStartup” to 0. You’ll see in the above screenshot another setting we recommend changing under “Check for promoted e-mail every” X “minutes”. This setting tells the Exchange Router to look at the CRM related emails that have come to the sink mailbox and determine if any other person on the email is a CRM user so it can update those users’ Outlook with the notification that an email sent to them has been created as a CRM activity. In very large deployments of CRM, the traffic generated by this activity will likely lead to a performance impact that be more troublesome than the feature will be worth. I recommend you take a hard look at these settings before rolling out CRM to avoid any potential negative perceptions that may occur when it takes a few moments longer to launch Outlook once CRM has been installed.